It's Thursday, so I feel compelled to share something I love with you for this third installment of Things I Love Thursday, because I'm just giving like that. So here's my TILT installment for the week. The Jamie Oliver Food Revolution cookbook. My photography skills do a disservice to this great book! Buy it. Use it. Love it. There are many reasons this is my go-to cookbook when I want a new idea for dinner. I love the layout, and the lovely photography. I love it that he suggest measuring things in lugs, handfuls and bunches. It gives me confidence that it doesn't have to perfect, just perfect-ish. By giving leeway in certain measurements it makes me believe that cooking really is mastering the art of close enough, and if you have 3/4 of a cup of lentils today, but only 1/2 a cup left next week, chances are, you can still make it work. It just occurred to me now that perhaps all those terms might be actual measurements in Britain, but so far cooking ishly is working out very well for our family, so I'm gonna stick with my original story! I love this book because I have yet to make something in it that my family hasn't loved, and keeping seven people sufficiently sufficed is no small feat! I love the variety in the book as well: seafood, pasta, curries, comfort food, desserts - the whole gamut is there There's an incredible variety of absolutely doable recipes. It's also quite a bit of fun to cook with because it works best when you read a recipe using an English accent. It might make your dinner taste 18% better, even. It makes me want to call my boys blokes and say to my daughter "this is a brilliant casserole you've just made, smashing job!" "Tell Jamie to bring Jules and the kids over and we'll all tuck in together!" This brings up a totally different question - do you think that people over the world ever marvel at the beauty of our Canadian accents? And I know - really, there's not just one Canadian accent just like there's not just one English accent, but I wonder if English chaps ever tire of being told the best thing about them is their tone and timbre....eh? And lastly, I love the whole purpose behind the food revolution itself. "Friends teaching friends how to cook good, honest, affordable food and just generally be a bit more streetwise about cooking." This is something I wholeheartedly support. Getting your kids to eat and love a variety of foods starts with parents cooking and loving a variety of foods. Exposure is a good thing, and this cookbook is chock-a-block with great meal ideas. It's really worth taking the time to eat real food; the rest of life works so much better when our bodies aren't running on empty! And don't let foody sites scare you off of cooking, like it can't be done by everyone- you don't have to make it fancy, just make it fresh and real and your life will thank you! I feel it would be remiss if I didn't follow-through and share one of our family's favourite recipes from the book. I've modified it using chicken instead of lamb, as that's not easy to come by here. If you get a chance,do try lamb sometime - it's divine when cooked right! Just don't buy rubbish mutton! I don't even know if you could get mutton this side of the Atlantic... I just wanted to say rubbish in a sentence and take it for a spin. Bottom line - I'm sure it works with either. We have chicken in spades here in BC, so that's what I use. This recipe freezes like a dream, so I usually make a huge batch of it, freeze the leftovers and then I pop it from the freezer into the crock pot for another dinner when the schedule gets packed and/or I don't feel like cooking that night! 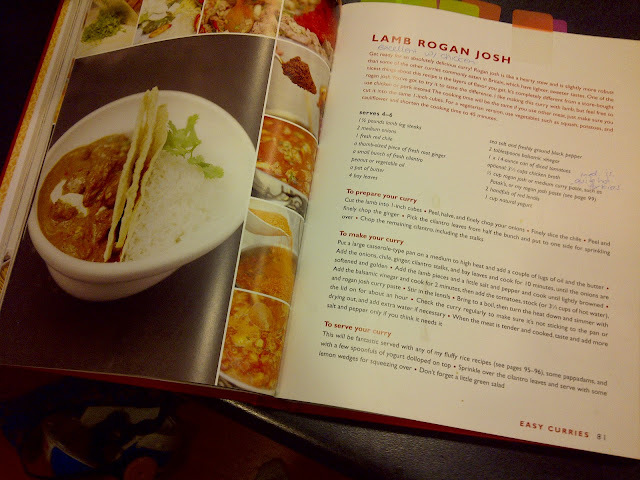 I am sharing my modified version, the original is available in the Food Revolution Book! a thumb sized piece of fresh ginger root, peeled. In a large heavy bottom pan (because of the amount I usually make, I often have a few pans going at once for the frying at the beginning and then I combine it into my enormous stock pot - you just want whatever it is to handle the volume and the high heat!) on med-high heat add a couple blobs of oil, and the butter. * Add the onions, ginger, cilantro, chile and bay leaves and cook for 10 minutes, until the onions are soft and golden * Add chicken and cook until lightly browned ( try not to overdo it, it will have plenty of time to cook through afterwards! )* Add the balsamic vinegar, cook for a couple of minutes more * Add the tomatoes, the chicken stock and the curry paste *Stir in lentils* Bring to a boil, turn down to a simmer and leave it with the lid on for about an hour. * Check regularly to make sure it's not drying out, add more chicken stock or hot water as needed. * When the meat is cooked through test it out and season with salt and pepper if needed. *a note about curry pastes - do check the ingredient lists of whatever brand you are buying. I like Pataks because it's ingredient list is short and not chock full of chemicals and dyes. Serve with rice, or quinoa. Add some warmed up Naan bread to the side, throw on a dollop or two of yogurt and you're set! Toss a little cilantro over the top to make it look like you really know what you're up to. Add a salad and your meal is complete! Teach your kids how to do the dishes and then whole meal can be made without regrets! Is there a cookbook you love? Tell me about it on your blog then link to it in the comments section! Good things were meant to be shared! This is awesome! I whole-heatedly agree...Jamie is amazing. I watch his cooking shows on food network. He goes out to his garden, picks a bit of this 'n that, then cooks it simply and beautifully. I've always cooked using measurements like dollop and handful. So much so, people have stopped asking me for recipes because I simply don't have them. Love your writing Karina...good job. :) keep it up! Hey Lorilee! Thanks for the encouragement. You keep it up with your cooking - maybe you should start writing your recipes a la Jamie Oliver and then we can all benefit from your skill!